Carry your sidearm suited to personal preference with the Gould & Goodrich 896 Ambidextrous Holster with Removable Body Shield. Designed for total customization, a removable steel clip allows for inside waistband (IWB) or outside waistband (OWB) carry, while belt slots provide traditional off the belt carry. The ambidextrous design allows the holster to secure where you like, for strong side, cross, or appendix style draws regardless of your dominant shooting hand. 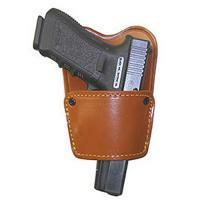 A removable, leather body guard provides added protection. Genuine leather and a suede lining guarantee a strong and secure hold that won't scratch the finish of firearms. Whether looking to conceal your firearm or professionally display it, the 846 Ambidextrous Holster is guaranteed to have you covered.